Pastry Chef Nicole Rucker’s Sweet Potato Pie, inspired by Martha Lou’s Kitchen in Charleston, South Carolina. 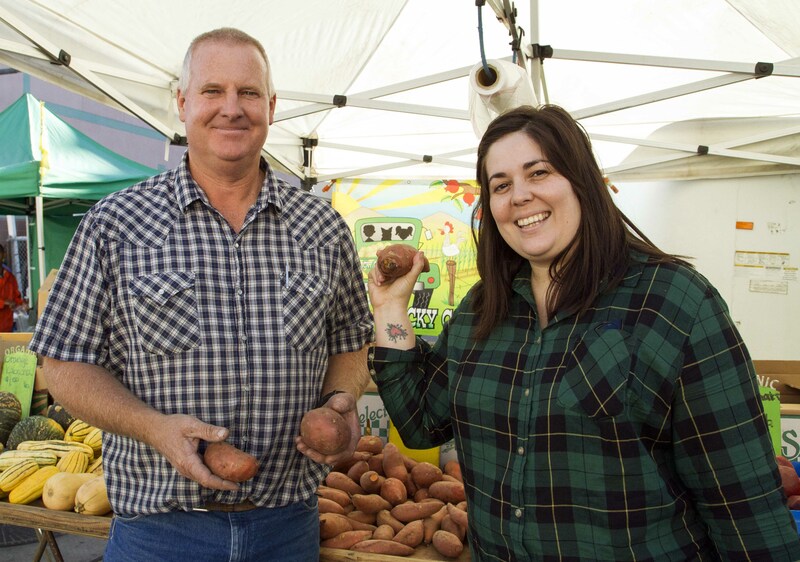 Greg Nauta of Rocky Canyon Farms and Nicole Rucker of Cofax Coffee show off their garnet yams. During a recent trip to Charleston, South Carolina, Good Food Pie Contest champion and Cofax Coffee chef/co-owner Nicole Rucker fell in love with the sweet potato pies baked by 85-year-old Martha Lou Gadsden of Martha Lou’s Kitchen. Inspired to create her own version of this unforgettable sweet potato pie, Nicole began experimenting once garnet yams came back into season this fall in Southern California. For her recipe, she prefers to use the Rocky Canyon Farms’ smaller, baby garnet yams, which she says are less fibrous and have a a luscious, creamy texture. Sweet potato pie filling typically takes the form of a smooth purée, but Nicole fork-mashes only one cup’s portion of her yams, leaving the rest as chunks, for that rustic, fall pie effect. She then encloses her sweet potato pie filling with thick lattice work on top, but you can really create any design of your choice. If you’re curious to try Nicole’s Rustic Sweet Potato Pie or any of her other Thanksgiving pies, she’ll be selling them by the slice at her pie salon this Saturday and Sunday from 4–8PM at Cofax Coffee. So bring your pie questions, learn insider baking tricks and exchange pie recipes with Nicole. Yield: One 9½” pie. You’ll need a 9½” pie plate. To Prepare the Pie Dough: Place 1 portion of pie dough in pie plate and put in freezer to chill. Roll out second portion of pie dough and cut into wide 2” strips for an extra fat lattice top crust. To Prepare the Pie Filling: Place the yam chunks and ¼ cup of water in a baking dish and cover tightly with foil. Bake in a 350ºF oven until just tender. Remove from oven and set aside. In a medium pot, bring water, sugar, salt, spices and butter to a boil. It will expand as it boils so be sure to use a tall pot to prevent the contents from boiling over. Remove the mixture from heat and pour over yams. Allow the yams to cool in syrup until everything reaches room temperature. Using a fork, roughly mash about 1 cup of the baked yams and mix the mash back in with the rest of the cooked yams. Put the mixture into your prepared, chilled pie plate and lay the strips of dough across your yam mixture in any fun formation—lattice is not the only way to decorate a pie! Paint the lattice strips with cream and sprinkle the sugar. Baking: Chill the pie for 15 minutes in freezer before baking in a 375ºF oven for 45 minutes to 1 hour. * The filling will bubble and boil a little. Check to see that both the pie bottom and top turn golden brown. Serve warm with ice cream! Optional: During the last 20 minutes of baking, lay some marshmallows on the surface of the pie and allow to bake and toast in the oven. I always weigh my ingredients, which is essential for accuracy when following a recipe. All of your ingredients should be cold. Mix the water, vinegar and sugar into a syrup and set aside in refrigerator to chill. To Prepare the Dough: Pulse the flour, salt and butter in a food processor until everything turns the size of medium peas. Spread this fatty flour mixture out onto a well-floured, flat work surface and gather it into a pile. Pour half of the sugar syrup over the mixture and begin working the ingredients together gently, using your hands. This is messy work. Squeeze the dough together and lightly rub the butter peas into the flour. Use the palm of your hand, pressing against the table gently to smear/rub the dough together. Sprinkle on more of the syrup and keep squeezing and rubbing. Try to work quickly so that the butter does not melt. This is the key to a flaky pie crust. When the dough comes together as a shaggy ball, wrap it in plastic and allow it to chill in the refrigerator for an hour. This relaxes the gluten and brings the dough together. After an hour, portion the dough into 14-ounce balls and roll them out to roughly a 1/4” thickness. Lay the dough in your pie plate and allow to chill as you mix your filling. Hey guys, need advice about making pies and other stuff for thanksgiving? Come by @cofaxcoffee this weekend, I’ll be there serving pie and we can talk about pie and stuffing and turkey and all kinds of delicious things. 4-8 pm – I’m even bringing recipes!